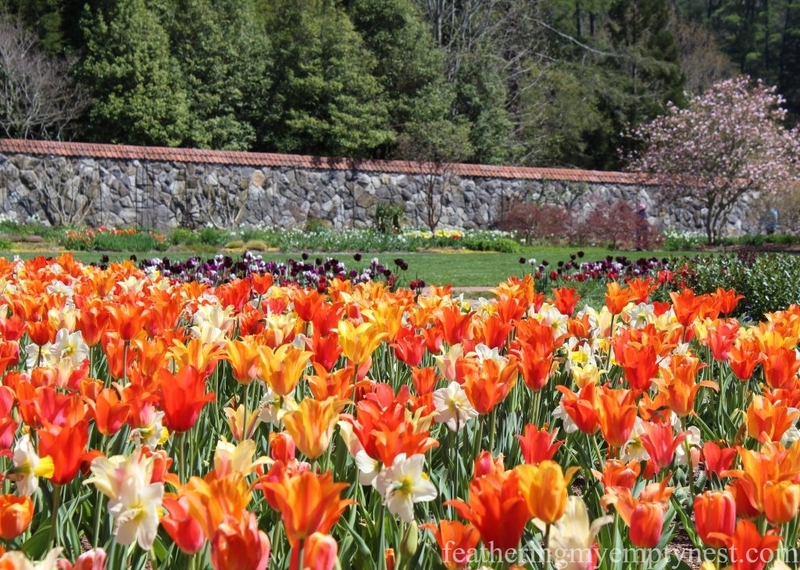 If you read last week’s post you know how wholly inspired I was by the spectacular display of thousands of multi-hued tulips which I had to opportunity to view during my recent visit to the Biltmore Estate Gardens. Incredible tulip display inside the Walled Garden at the magnificent Biltmore Estate in Asheville, North Carolina. I would dearly love to be able to grow these showy bulbs in my yard but have learned, through several failed attempts, that as soon as these precious bulbs emerge from the ground, herds of rampaging deer in my area are basically hearing the dinner bell. So, alas, because it’s not possible for me to create a Biltmore-style walled garden around my property, the only bulbs I can successfully grow in my neighborhood are daffodils. I’ve learned the reason deer leave daffodils alone is that they contain lycorine, a bitter substance that is poisonous. Hungry deer will eat almost anything in your garden but tulips seem to be one of their favorites. 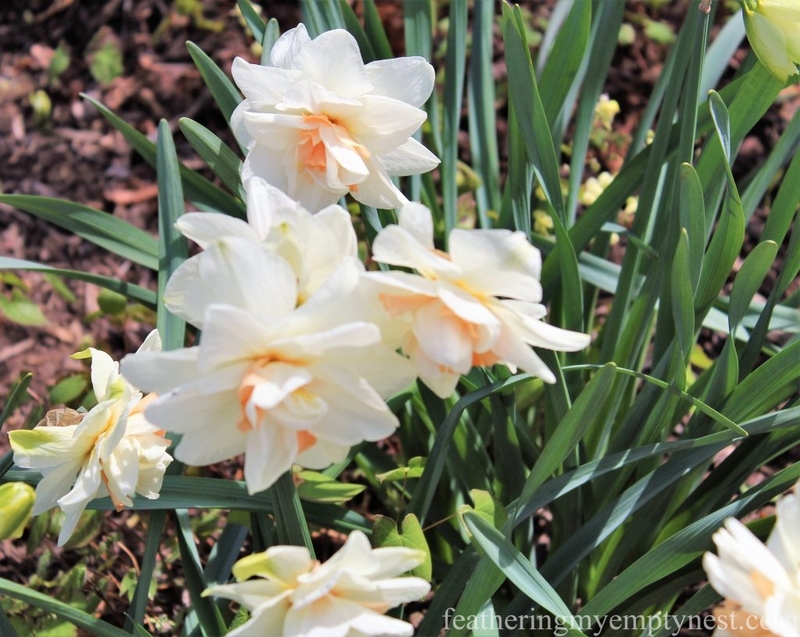 Now, there is nothing wrong with daffodils, particularly these days when so many different beautiful varieties are available. However, there’s just something about the shape and the colors of tulips that really appeals to me. Since I can’t grow my own tulips, I tend to buy many cut bunches of the colorful bulbs throughout Spring, when they are readily available in the grocery store. Trader Joe’s is my favorite place to purchase a wide variety of relatively inexpensive quality flowers. 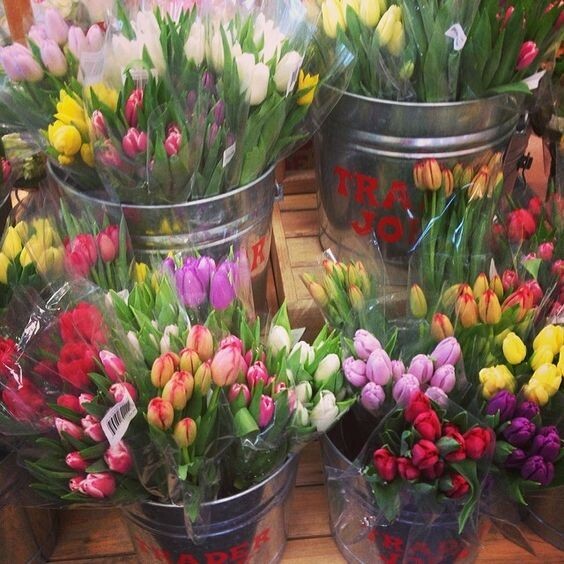 A huge assortment of relatively inexpensive tulips is available throughout the Spring season at Trader Joe’s. Market bunches of tulips typically contain 10 stems. 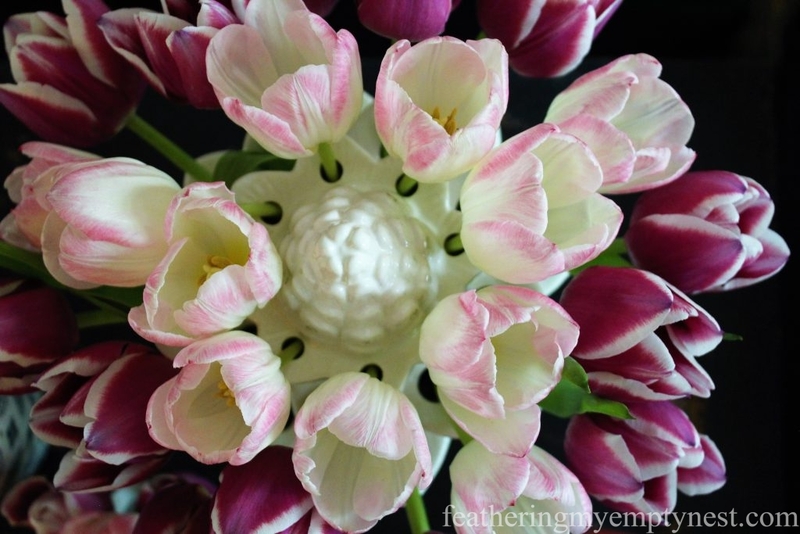 As much as I love tulips, they are a bit tricky to arrange because they tend to have a mind of their own. Not only do they continue to grow after they are cut, but they also bend, droop and don’t really stay where you put them in your arrangement. 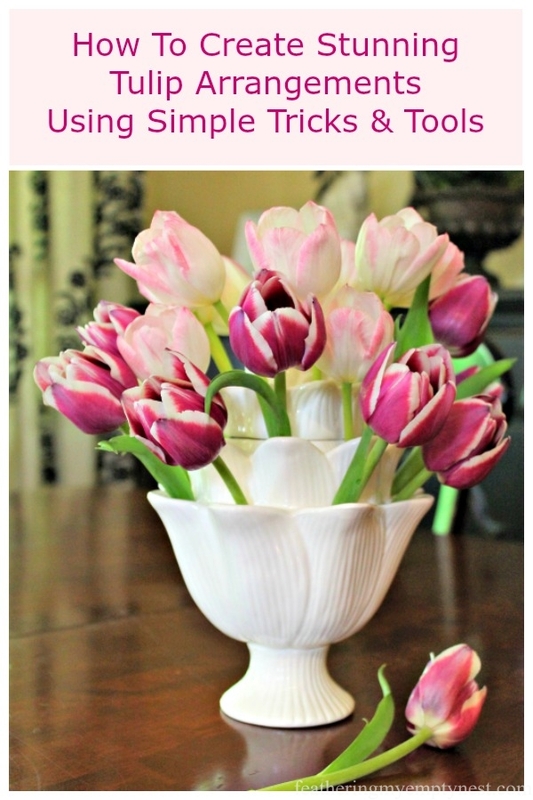 Because of this, and because tulips stems are often too soft to insert easily into floral foam, I like to use various flower arranging tools when arranging tulips. One such flower arranging tool that is specifically designed for arranging tulips is called a tulipiere. Initially, tulipieres were fancy vases with multiple spouts, intended to display a single forced tulip bulb in each spout with a common water reservoir in the base. Tulipieres first came to prominence during the tulip trading mania which occurred from 1636-1637 in Holland. These elaborate tulip vessels were most often created in, the quintessentially Dutch, blue and white pottery called Delftware. Quite grand in scale, tulipieres were a considered a status symbol for the wealthy elite of the time. During the Victorian era, tulipieres became fashionable once again, when they were more commonly used to display cut flowers. Nowadays, these functional and attractive tulip vases are available in a variety of styles and sizes. 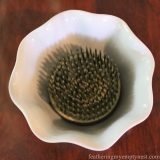 I recently purchased this nine-inch white ceramic tulipiere which is shaped like an artichoke. 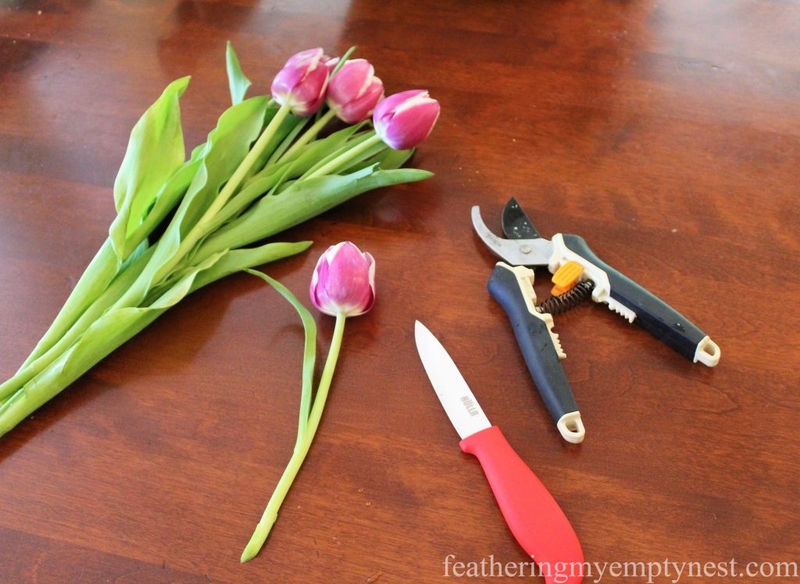 To prepare tulips for arranging in my tulipiere (or any type of vase), use a sharp knife to cut away all, or almost all of the leaves, except for the topmost leaves that will be above the waterline. 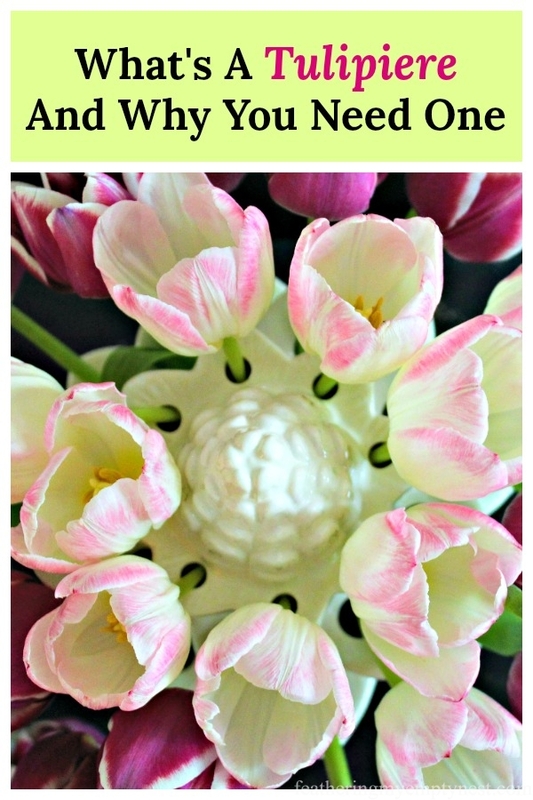 This will prevent the rapid growth of bacteria and allow your tulips to stay fresh as long as possible. Once you’ve stripped the leaves, use secateurs or flower-cutting shears to cut the stems at a 45° angle so they can absorb water easily. 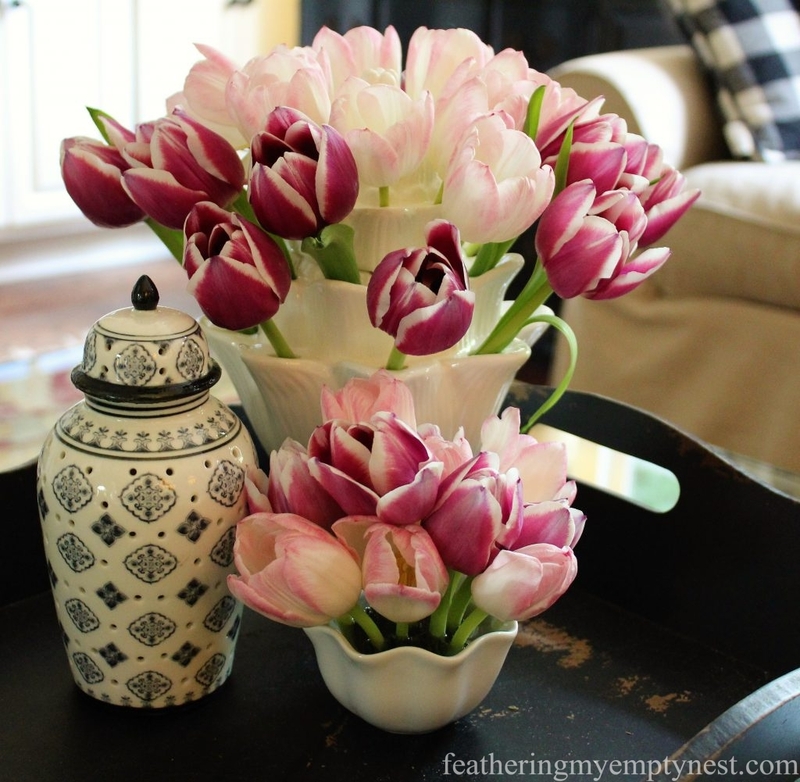 Tulips last longer in less water, so fill your vase only one-third to one-half full with cool water along with a packet of floral preservative. Separate bunches of different lengths of tulips with leaves stripped and stems cut at an angle for arranging in each tier of the tulipiere. 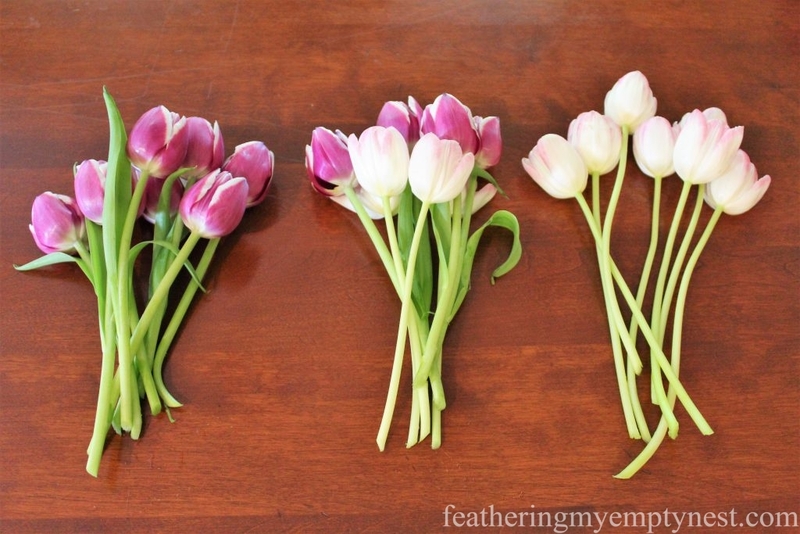 For a tulipiere like mine, it is necessary to cut the tulips in different lengths for each tier leaving the top-tier stems the longest so they can reach the shallow water. I also discovered that it is easiest to insert the tulips in the top level first and work down to each successive tier. Tulipiere with the top removed for placing water in the base. Another flower arranging tool which is useful for arranging tulips is a flower frog. Frogs are small devices that sit in the bottom of a vase or bowl and are made up of a series of holes or metal needles designed to hold flowers in place. 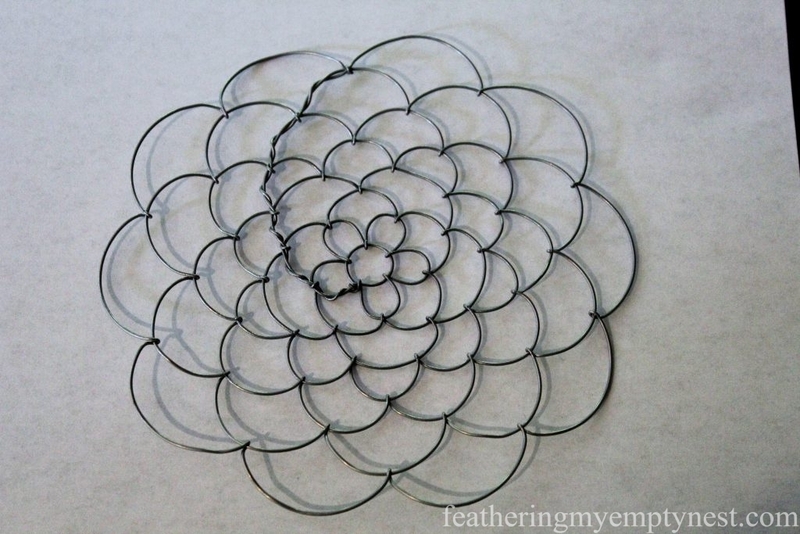 Metal needles hold flowers in place. Floral frog turns a small condiment dish into a vase. 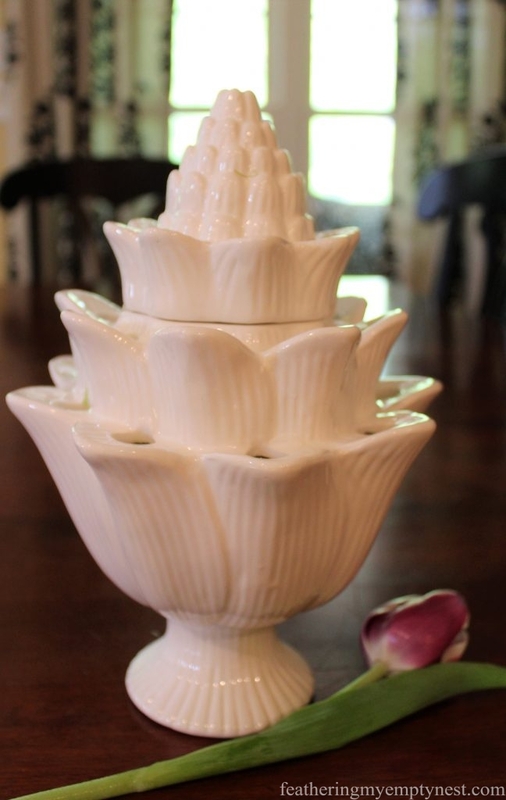 A flower frog turns this small fluted condiment dish into a viable vessel for a diminutive flower arrangement that coordinates perfectly with the tulipiere. 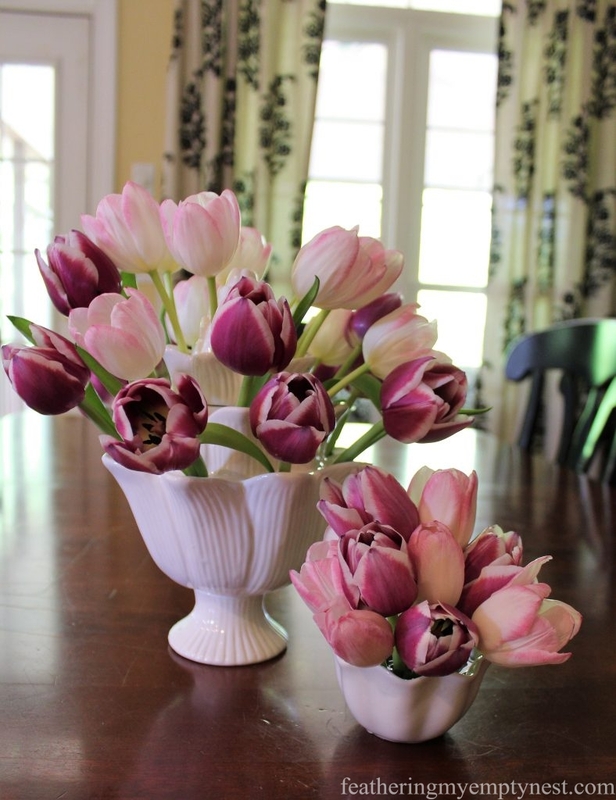 While tulipieres and short cut-stems with frogs tend to keep unruly tulips in place, sometimes it’s desirable to create arrangements with more loose and free-flowing tulips. 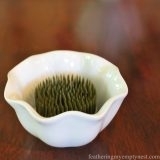 However, if you use a wide mouth vase, it helps to have some kind of framework to help keep your flowers from traveling. You can use waterproof tape to create a grid on top of the opening of the vase, or you can use this Easy Arranger to hold your flowers in place. 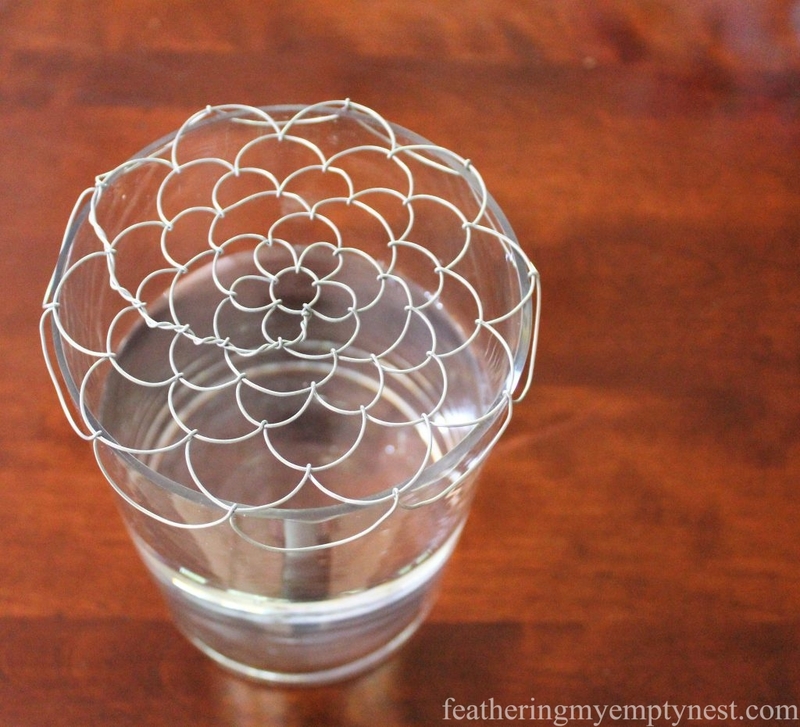 One of the great things about using this wire arranger is that you can easily remove it from the vase, leaving the flowers in place, when you want to change out the water. The galvanized wire floral shaped grid bends to fit over the edge of your vase and provides a series of different sized openings for placing your various stems. 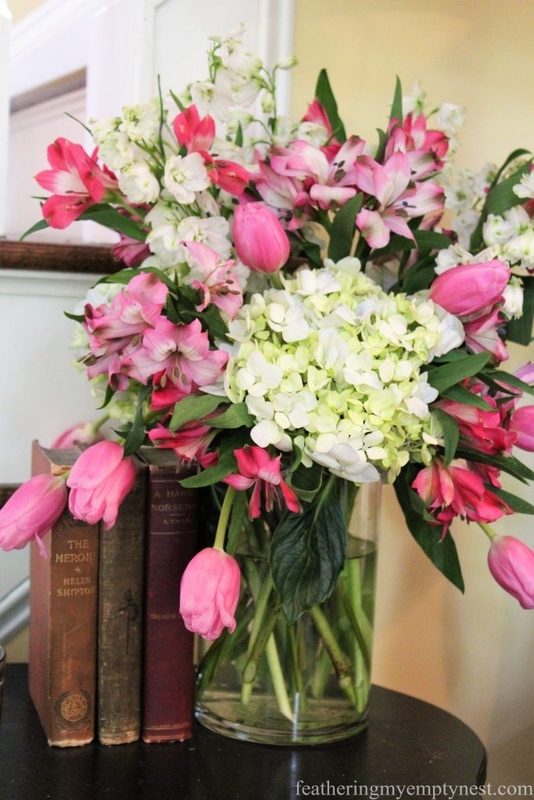 This flower arrangement with tulips, hydrangeas, alstroemerias, and white delphiniums was created in a wide-mouth cylinder vase using a wire flower arranger. One last way of corralling wayward tulips I like to use is to place a few long-stemmed showy specimens entirely inside a glass cylinder. 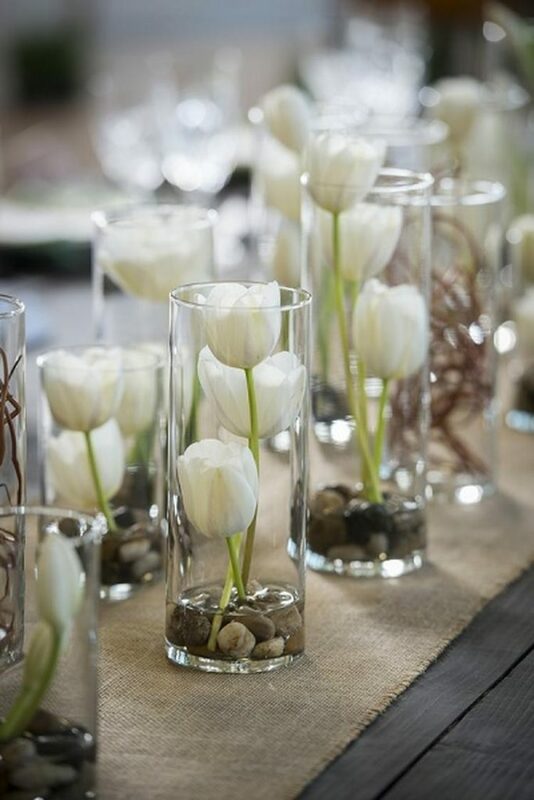 The tall glass vases keep tulips upright, while stones or pebbles scattered in the base help to position the stems. 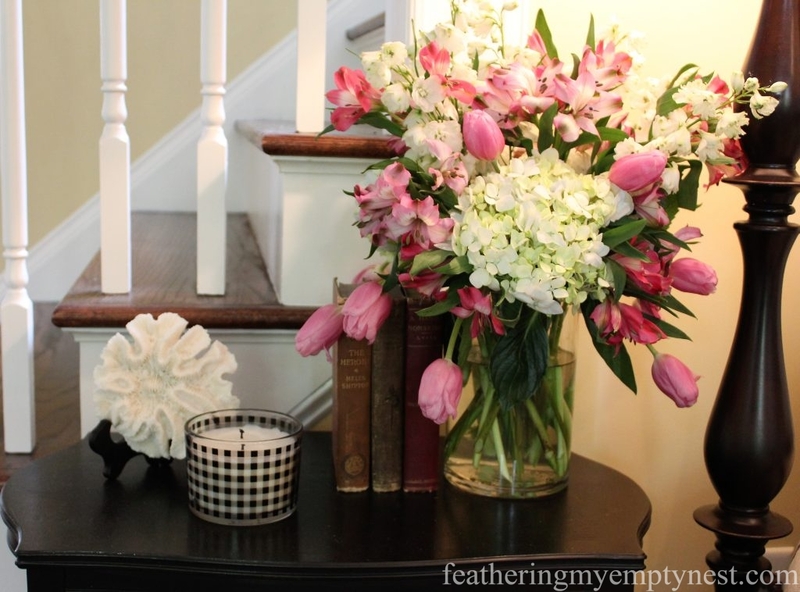 Even though tulips are not particularly long-lived cut flowers and, they tend to do their own thing, you can bring these beautiful Spring bulbs into your home and easily arrange them with confidence using a tulipiere or other simple flower arranging tools. 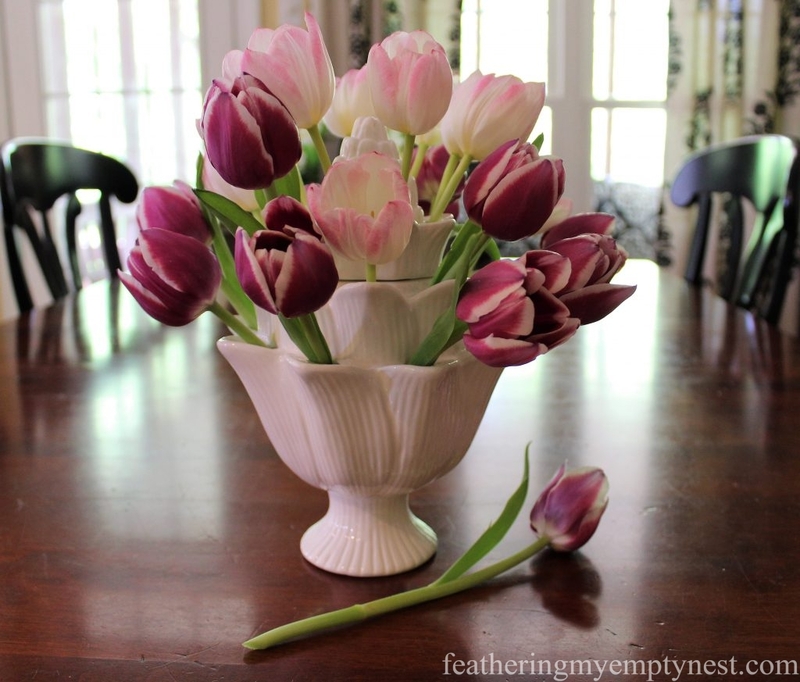 I had never heard of a tulipiere– what a neat lesson in decorating history! Your arrangements are gorgeous, definitely getting me pumped for spring! Thanks so much for the shout-out–lovely post! You’re very welcome. Thank you for your kind comment. I obviously enjoyed your post as well! Love the tulipiere you found—much better than a pagoda one. 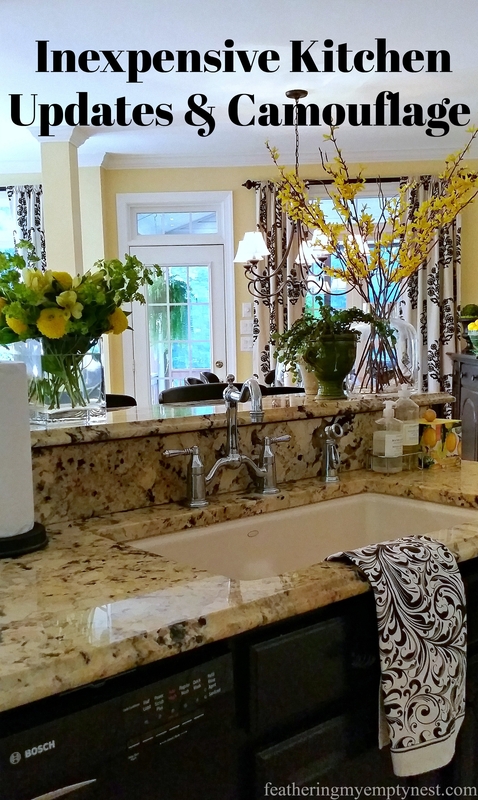 So glad you could use the wire arranger—that arrangement is gorgeous! 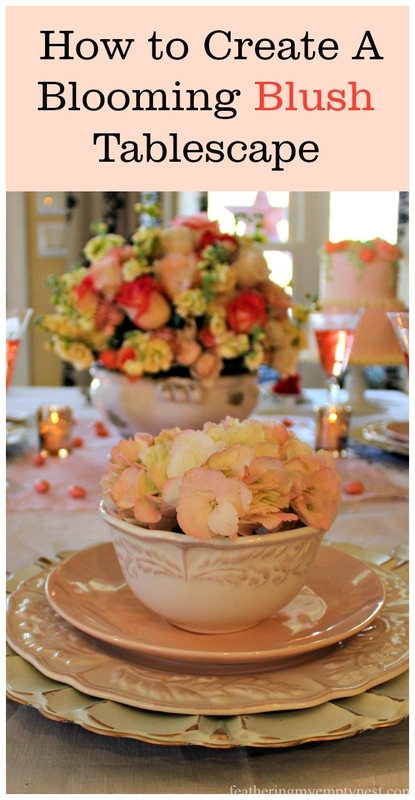 You really have a knack for floral arranging. Thanks, Amy. The flower arranger is really neat. I don’t know if I have a knack but I do enjoy arranging flowers. 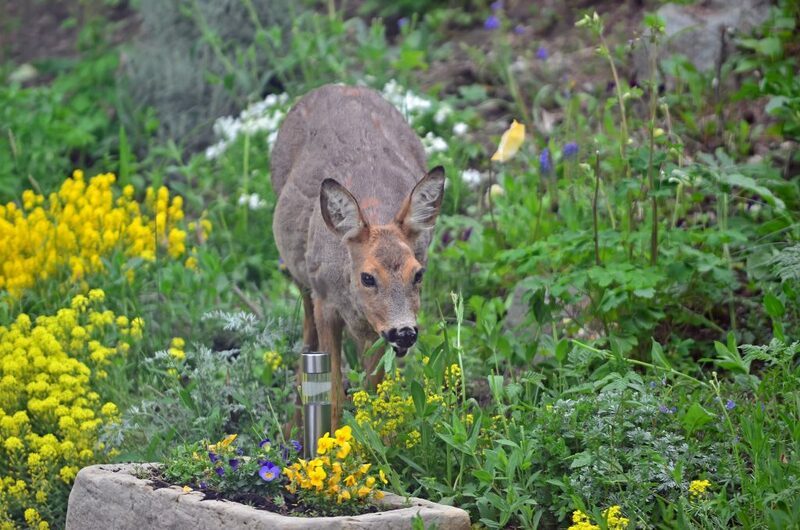 I do have the same problem with deer and love tulips in Spring. 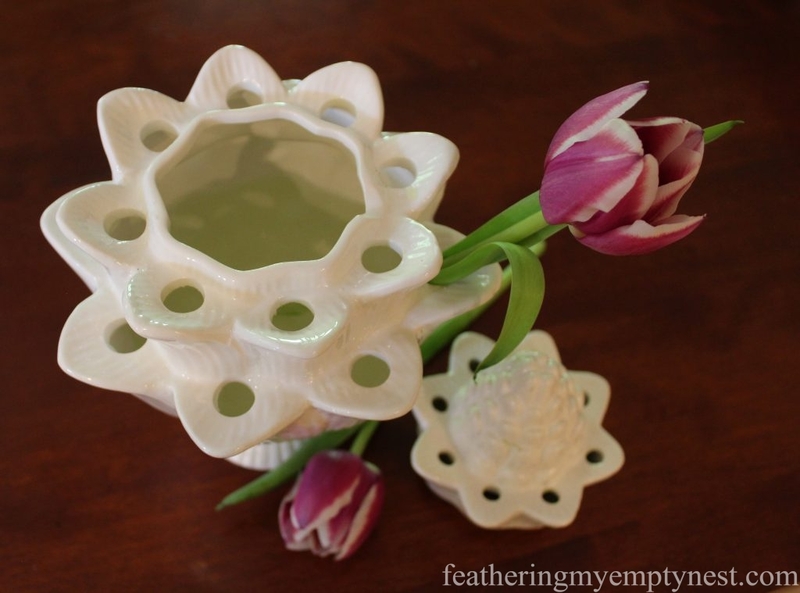 So I loved the tulipiere container idea. I’m a tape grid kinda woman. I have to say I am going to be looking for a tulipiere while I’m about town. And may I say I am so thankful that Spring is finally here! Thanks, Deborah. I am happy Spring is finally here too. I’m dying to get my hands in the dirt! All the flowers were delightful and you did such pretty arrangements. They were all lovely. 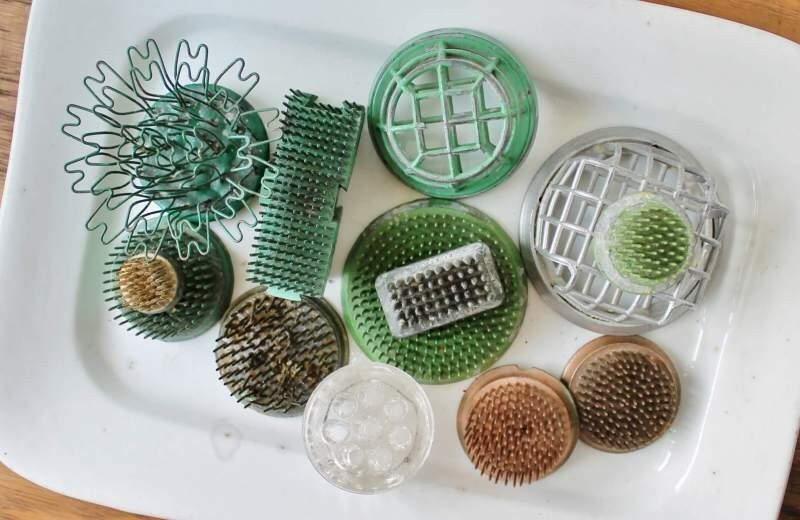 Thanks for sharing them with us, and for the tips. Thanks so much for your kind comment. Happy Mother’s Day! 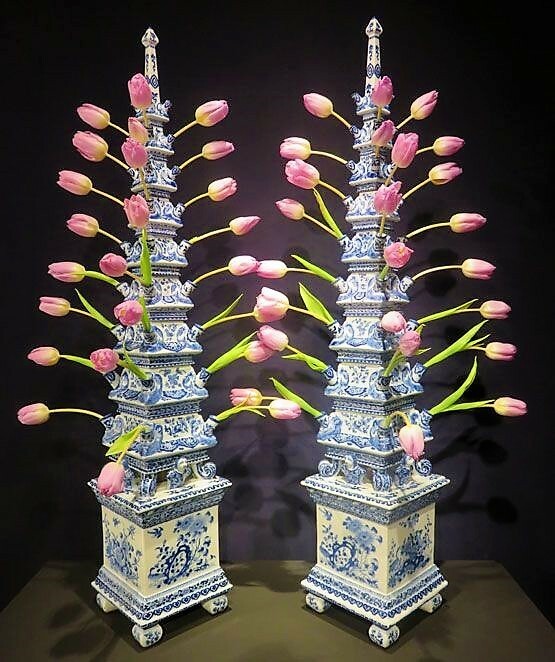 I love the arrangement with the Pair of antique blue and white Delft tulipieres, do you need to put water in the tulipieres? Thanks so much for your comment. To answer your question, yes, tulipieres have a water reservoir in the base that you fill (the top lifts off for easy refilling). 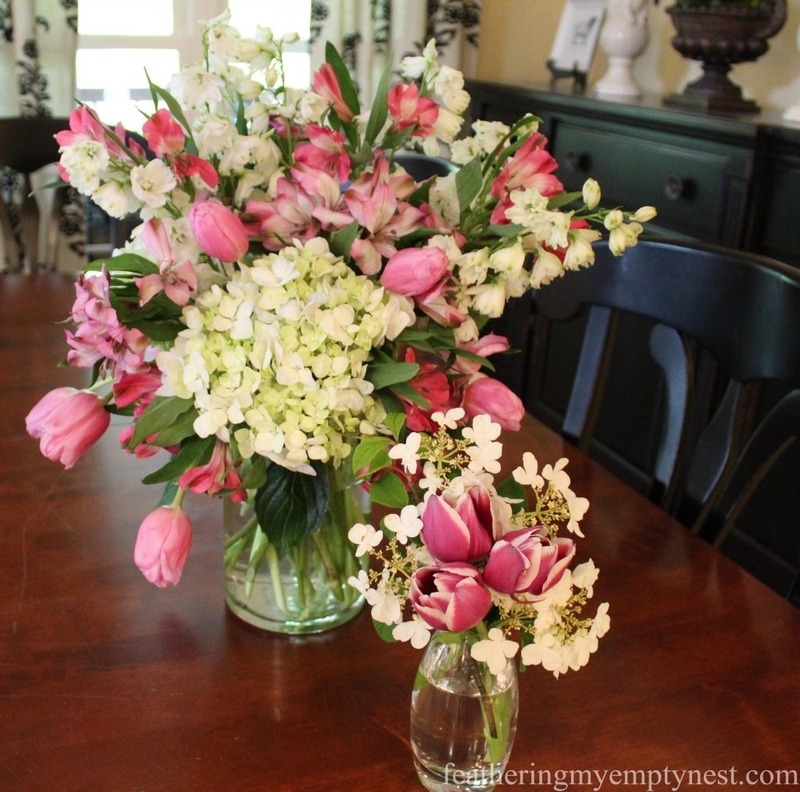 You need to make sure when you cut your flowers, that the stems are long enough to reach the water, keeping in mind that cut tulips do well in relatively shallow water. Thanks for the very helpful post. Although I love watching the tulips bend and do their own thing, but I had no idea how to corral them for a different look. Your pictures and instructions were so clear and beautiful that I subscribed. I’m looking forward to reading more. Best wishes. Thanks so much for your kind comment and for subscribing. I hope to provide you with future posts that will be of interest to you. Wow – what amazing photos. Love flowers of all varieties. So helpful! My friend sent this article to me last night. She’s asking me if I can help her in arranging flowers for her daughter’s debut. I told her that it’s my mom who’s into it but I can assist her with some other tasks that I can.